Today started off with many sad goodbyes as we had to leave the AHI staff. To say we were welcomed is an understatement. The hospitality didn't get any better than AHI! We stirred by the side of the road and picked up since balls made out of garbage sacks that we had pre ordered from and young boy. 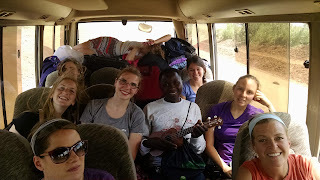 The journey to Gulu was promising at first, that is until we hit the construction. As I currently write, we have several hours to go and a journey that should be two to three hours looks like it may be 5-7 hours. It is dusty and hot. The volunteers are ask getting to experience roughing it fur the first time. In contrast, our roughing it in a comfortable bus doesn't compare to the hundreds of people we see walking with heavy loads and no shoes in the hot, dusty weather. 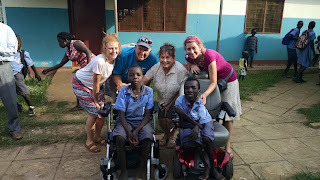 We are on our way to St Jude to deliver Paul's wheelchair. He doesn't know we are coming so it should be really exciting for him! Update! What an experience we had!! We arrived at St Jude children's home in the late afternoon. The road to Gulu is usually 3 hours when the road is good. Unfortunately, the road was bad and there was a lot of construction so the normally short drive took about 8 hours. After arriving, Suzy and the group went to say hello to Paul. He didn't know we were coming or that Bruce was there. It had been 4 years since the last time Paul had seen Bruce. after distracting Paul for a minute, Bruce Road the electric wheelchair around the corner and pulled it up next to Paul. At this point, a large group of rowdy children gathered around and it became difficult to hear what Bruce was saying. 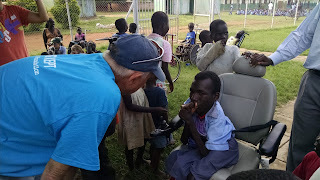 He said to Paul that four years ago he made a promise to him when Paul said his dream was to have an electric wheelchair. 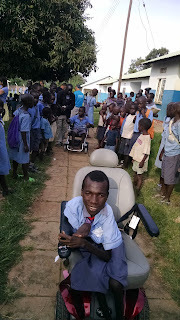 He told Paul that he kept his promise and that the wheelchair he was driving was actually for him. What took place, was so intense and beautiful that words are not adequate to describe. Paul was transferred into the wheelchair and with his very weak hand began maneuvering the device and for the first time in many years have the ability to control his destiny. 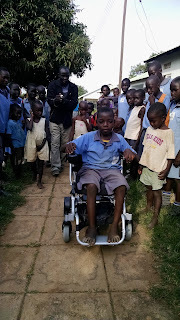 It didn't take long for him to figure out how to maneuver the wheelchair throughout the compound. 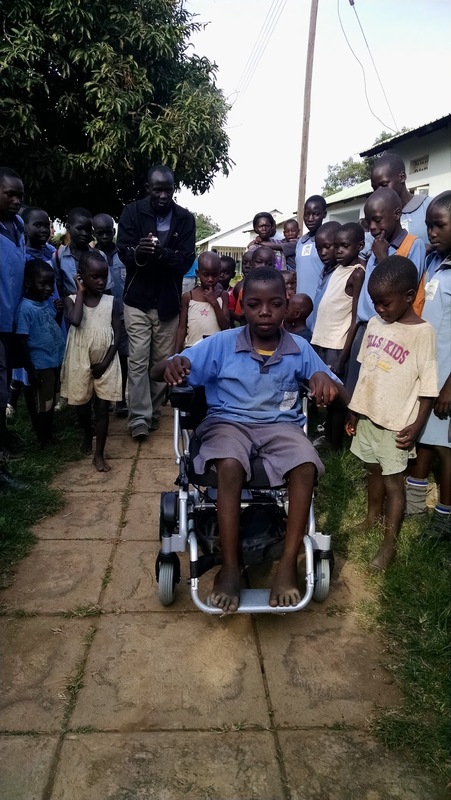 After Paul received his wheelchair, the headteacher made a decision to distribute the second electric wheelchair to Paul's brother Vincent who also has muscular dystrophy. We had a special surprise when we found out that the boys have a biological mother and that she was at the compound. Her joy was very great as was Paul and his brother. I think words escaped them, but the tears that fell from Paul eyes were enough to let us know he was very happy. It was a very beautiful experience, and there were not many dry eyes. Kara: Baboons on the side of the road, singing to Brigdet at the St Jude's. Hannah: Lady on the side of the road with the goat head. 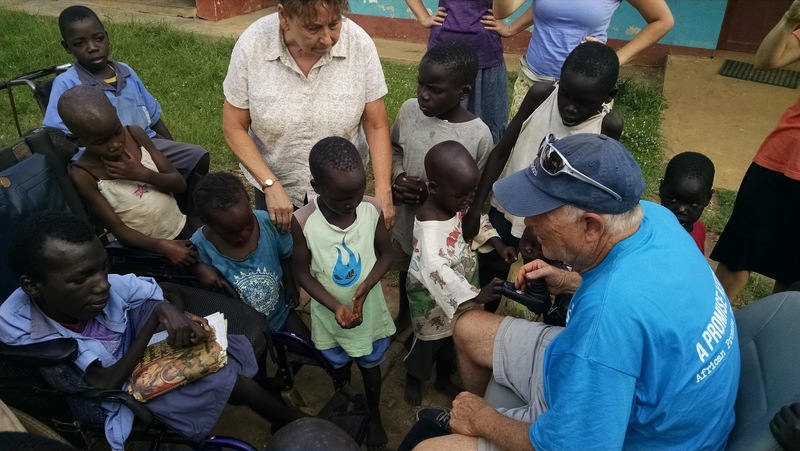 Steve: Talking to Kuganda about all things Uganda. Brin: catching the moment with Paul getting his chair on camera. Alex: Tears of joy from Paul as he received his chair. Seeing Kara sing to the little girl. Being in the North for the first time. Becky: Seeing Bruce and Ginny giving each other a hug after delivering Paul's chair. They had finally delivered a promise! Bruce: To see Paul and his mom. To be able to give her some money from his grandson to help with her family. Ginnie: Seeing Paul received his chair and knowing how long of a road it was. Thinking of the 'Go Fund Me' page her family had all helped out with. They stepped up to the plate and made it possible. Suzie: Watching Hannah step in human pooh and then stepping in it herself later. CARMA! Proud of her parents for the task of getting Paul a new chair, Giving Paul $5 from Peanut to start his own bank account. Amber: Paul receiving his chair, Alex playing the ukulele for the children, Ginnie spilling the salt on her food. Maddy: Seeing the how the countryside change as we went from the south to the North. Baboons on the road and the falls on the Nile River. Stacie: Seeing Paul get his chair and realizing he had a younger brother with MD also and we just happen to have brought another chair! What a tender mercy. Good job Bruce and Ginnie!